For the past two years, Frederick and Carroll Counties have been debating the Monocacy Plan: an advisory document meant to guide both counties on improving the health of their shared Monocacy River. But between 2017 and 2018, drastic changes were made to the Plan that gutted its value for protecting and improving the Monocacy's water quality and environmental health. We're urging the Frederick County Council to reject the 2018 Monocacy Plan - a position the Frederick County Planning Commission just unanimously agreed upon, as well. For more on our position, read our coalition letters to the County Council and Planning Commission below! I hope you'll add your voice for clean water in Frederick County: either by attending the Frederick County Council hearing on the Monocacy Plan this Tuesday, 2/26 (wear blue, and RSVP here!) or by emailing your thoughts to the County Council (click here!). The Smarter Growth Alliance for Frederick County is a coalition of local and state organizations representing approximately 16,000 members and supporters in Frederick County. We work to engage residents and policymakers in support of wise land use that values our rural landscapes, protects our natural resources, and builds on the unique character of our towns and cities to ensure a resilient and prosperous future. Regarding the 2018 draft Monocacy River Plan, we provided detailed comments to the Planning Commission (attached, dated January 11, 2019). Many of the concerns raised in our letter were shared by the Planning Commission. We support the Planning Commission’s recommendation to reject this plan. In our last correspondence to the County Council, we supported adoption of the draft 2017 Monocacy River Plan with the resolution concerning the purpose of the plan and incorporation of the Planning Commission’s recommendations. While not as robust as needed to improve the Monocacy River, we noted in our letter that this plan represents a compromise and its adoption could conclude a contentious process – an outcome that was not realized. At this time, we believe a more prudent, expeditious, and less contentious approach would be developing a Frederick County specific plan if that is possible. We thank you for your kind consideration of our comments. We appreciate the opportunity to comment on the draft Monocacy River Management Plan dated October 3, 2018. In the spirit of appropriately balancing stewardship of the River with protections of property rights, we ask that you recommend to the County Council the revisions outlined below. The Executive Summary should summarize significant ideas and recommendations included in the plan, not introduce ideas and recommendations that do not appear elsewhere in the plan. The List of Recommendations concludes with, “Conduct a comprehensive study of the entire Monocacy River watershed including Pennsylvania and Maryland, and take no regulatory action until such study is completed.” This recommendation does not appear elsewhere in the plan, making its inclusion in the Executive Summary inappropriate. Moreover, it is clearly intended to halt actions that could be taken today to improve water quality. Much scientific data about watershed science in general and the Monocacy River watershed in particular is already available; while additional scientific study is always welcome, it should not preclude needed progress on water quality and environmental health. We recommend deleting this recommendation in its entirety. Also within the List of Recommendations is, “Promotion of additional river access and recreation on public lands” followed by, “This plan does not support use of eminent domain or regulatory measures on private property.” This last statement does not belong in the List of Recommendations included in the plan. The list of Goals includes, “Implementation of the plan’s recommendations should not strip development or impede agricultural activities and other initiatives.” This is overly broad and not a goal. As such, we recommend it be stricken in its entirety. The final sentence of the chapter in the 2017 version of the plan concerned managing the river corridor to accommodate channel, riparian, and floodplain adjustment processes in order to reduce damages to existing structures, avoid new damages, and protect public safety. This was struck from the plan with the most recent revisions. As Monocacy flooding becomes more severe and damaging, it is essential that the plan acknowledge and address this issue. We recommend retaining the language from the draft 2017 Plan. A statement regarding archaeological sites within 200 feet of the River, which is based on an archaeological survey, was struck from the plan with the most recent revisions. 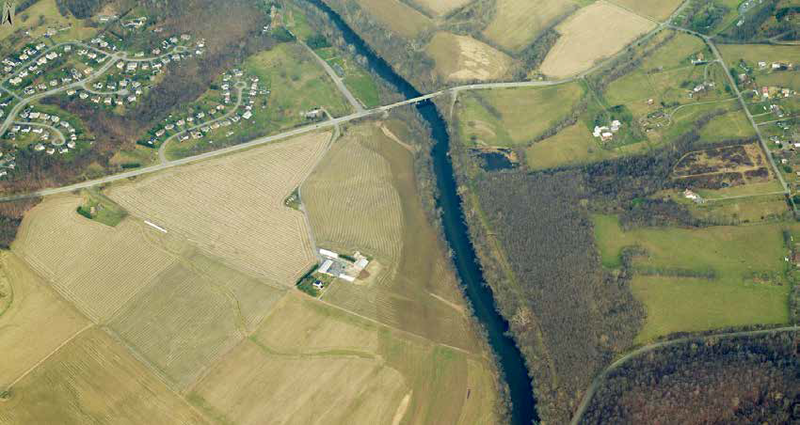 A recommendation of, “Identify and recommend appropriate uses and protective measures for areas in the Monocacy River Corridor that include significant archaeological and cultural resources” has been replaced with, “The Monocacy River has high potential for archaeological and cultural sites and their identification should not affect the rights of property owners.” This is not a recommendation. The recommendation regarding protective measures for areas that include archaeological and cultural resources should be restored, along with the background statement concerning archaeological sites within 200 feet of the River. Language in the previous version of the plan regarding reforesting critical gaps in the River’s riparian environment to a minimum of 150 feet along both sides of the River has been removed. Forested buffers are critical to minimizing nutrient and sediment runoff and, we agree, should be voluntary. The language from pages 5-10 through 5-11 of the draft 2017 Plan that has been struck should be restored. On page 5-12 the definition of green infrastructure has been removed, though the Green Infrastructure map and the term green infrastructure continue to be included in the plan. Accordingly, the definition should be restored. For the last bullet on page 5-2 (Wildlife and concentration areas) and the last paragraph under Water Fowl and Other Birds on page 5-18, we recommend reinsertion of “corridors” to provide clarity since reptiles and small mammals exist along the River, versus exclusively in the River. The plan previously included the following recommendation: “Request the Natural Resource Conservation Service Soil Conservation District (NRCS/SCD) to consider modifying management of Soil and Water Conservation Plans and Total Farm Resource Plans for River-front properties to focus on Monocacy Scenic River Best Management Practices (MSR-BMP) that actively restore floodplain function by enhancing woody riparian buffers along the Monocacy River mainstem.” This recommendation should be restored to the plan. If included in the plan and implemented, this recommendation could result in considerable water quality improvements. Page 8-3 states, “…the establishment of trails and paths along the River does not align with the Maryland Wild & Scenic Rivers Act and is not supported by the Monocacy Scenic River Citizens Advisory Board.” No explanation is provided. It is not clear how trails and paths do not align with the Act; also, the position of the Advisory Board does not belong in this document, particularly when it is conflict with planning documents that have been adopted by Frederick County’s elected officials. A recommendation concerning creating public access points to the Monocacy at MD 140 (Bridgeport) and MD 77 (Rocky Ridge) and improved access at Double Pipe Creek was struck from the plan with the most recent revisions. This recommendation should be restored to the plan. Recommendation 8-11 is vague; how will the Board work with the Maryland Wild and Scenic Act to provide protection for the River? We suggest restoring the language from the draft 2017 plan. We are concerned that significant information that enhanced the plan as a resource has been struck with the most recent revisions. This includes the list of plan recommendations that had been included in the Appendix and is ordinarily included in a plan of this kind, as well as the criteria for Audubon Important Bird Areas. For users of the plan, it is useful to have this information included in the document. Likewise, in Chapter 8 information about Frederick County’s goals and policies for parkland, recreation, and public open space have been struck, and in Chapter 7 scientific information about the benefits of forest buffers has been struck. Again, removing contextual and background information like this diminishes the value of the plan as a resource. We recommend restoring these items from the draft 2017 Plan. The word “corridor” has been removed from the plan resulting in incoherent or unclear statements in numerous places. The term “river corridor” is recognized and accepted in the scientific and planning communities, whereas the replacement terms like “area” or “connections” are not. It appears that removing corridor was intended to restrict the scope of the plan to the waterway itself and not properties along the River. The use of “corridor” should be restored to the document. The River is a critical resource for the region and the Monocacy River Plan should chart a course for improving the River’s health as a drinking water supply, recreational resource and wildlife habitat corridor. Without the above revisions, the 2018 Monocacy Scenic River Management Plan does not accomplish these goals.